At Tribeca Smiles in New York, NY, general and cosmetic dentist, Dr. Frederick Solomon, is a big Invisalign proponent. More than ten years ago, Dr. Solomon was so impressed with the technology that he became an early adopter. Since then, these clear aligners have only improved in quality and have turned out to be one our most popular treatments. So what are they? Invisalign clear aligners are custom-made trays that fit very snugly over your teeth. Throughout the several months of wearing them, you will keep advancing every week or so to a new set of aligners, which pick up where the previous aligner took off. This is because each aligner is slightly different in the progression for gradually shifting your teeth into place as prescribed by a custom treatment plan mapped out by Dr. Solomon. Nearly anyone can be a good candidate for Invisalign clear aligners. If you want straighter teeth but don’t want the hassle and the less-than-aesthetically-appealing issues of dealing with metal braces, Invisalign might be just what you need. Additionally, since many people associate metal braces with adolescents, the prospect of having a discreet, nearly invisible alternative is ideal for our adult patients. If you’d also like to have a removable solution lining up your teeth, Invisalign is also appropriate. You’ll still need to wear them about 22 hours a day, but many candidates also just like having the option of taking them out for special events, athletics, and more. Finally, a big factor for candidates is the discomfort. Metal braces are notorious for poking and cutting the gum and cheek, while a smooth Invisalign tray is easy on the mouth. 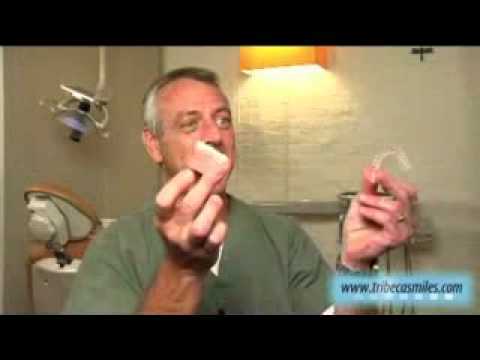 Before being fitted with the Invisalign system, Dr. Solomon will make impressions of your teeth. Those impressions will be used by Invisalign’s patented 3D technology to craft a series of progressively positioned clear aligners (they currently fill about 80,000 orders a week! ), which will move your teeth into place over the course of your treatment. The first aligner will fit on your teeth, but will also be tight enough so they can start gently coaxing your teeth to move. Each successive tray will move the teeth along a bit more every week. It’s not a difficult process, but it will take some getting used to having the aligner in your mouth most of the day. Invisalign aligners are a snap to take out. You can brush and floss like normal. The aligners themselves also need to be cleaned. This can be done manually with a toothbrush, or you may elect to buy an Invisalign cleaning kit, which can easily do it automatically with a touch of a button. You’ll need to remove them each time you eat food. The advantage of this, as opposed to metal braces, is that you can still go ahead eat whatever you’d normally eat without any restrictions imposed by metal braces. No food will get stuck in wires and brackets. No rubber bands will get in the way. After eating, you will just brush and pop your trays back in. If you’re exercising or playing contact sports, you won’t have to worry about brackets cutting your mouth anymore either. Invisalign started a revolution in teeth alignment, and we want you to have the latest and greatest technology by getting you in on that revolution. Dr. Solomon is an Invisalign pioneer and is ready to help you get the smile you want with your own custom-made Invisalign treatment. We’re in a cozy loft nestled in the heart of Tribeca, so if you’ve been thinking of straightening your teeth, drop by to set up a consultation with Dr. Solomon. We look forward to hearing from you and can’t wait to help.